Whether you're a novice or a digital expert, we all like to analyse the performance of our site content. Is what I put online good enough? Is it attracting the people I want? Is it better than my competitor's offering? Sometimes even it's subconscious, like when we check the number of tweets we get from a new blog post. Other times, we make more conscious efforts, like reviewing performance metrics in Google Analytics. As your site grows it won't be that easy to analyse your site at such a granular level and you will need to break it down into logical pieces you can analyse in isolation. This is where content grouping reports can make all the difference. By automatically grouping your content and its performance metrics into logical pieces that you have predefined, literally, takes half the work out of reporting. 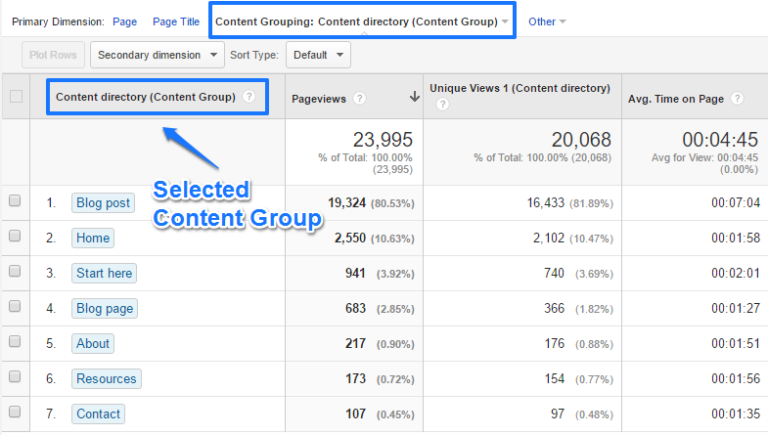 So how do you find content grouping reports in Google Analytics? Here are 5 ways! There are different ways to reach reports in Google Analytics that will make use of your content groupings, each has their own data sets and metrics to explore. Step 1: Navigate to Behavior >> Site Content >> All Pages. Step 2: Select your Content Grouping. Now you have a more aggregated view on your content performance. In this case, 80% of the pageviews are on blog posts. People spend by far the most time in this section of the website. Normally you would have to drill down or search to find more information on your other content subsets since they have a relatively low volume of traffic. Now you'll have an easy way to put things in perspective. Step 1: Navigate to Behavior >> Site Content >> Landing Pages. Step 2: Select your Landing Content Group. The evaluated goal is on “Option Feature Box Clicks”. Almost 90% of the traffic lands on a blog post. In absolute numbers, the blog posts are responsible for 2/3 of all conversions. The “homepage” and “start here” page convert really well. The “homepage” converts three times above average if compared to its traffic percentage. In short, you can get a very quick overview of how your landing content groups actually perform. Step 1: Change Group pages by to the name of your content grouping. Step 2: Change Current Selection to one of your content groups, e.g. Blog Post. More than 80% of the visitors leave the website on a blog post. 7 out of 10 people that view another page go to a blog post. 10% continues to the “start here” or “home” page. The “resources” page, where a lot of affiliate links are embedded, gets 2% of all clicks of people that continue their journey. These quick insights are impossible to get from the default settings. The Behavior Flow report isn’t my number one report, but it can be useful in some cases. It visualises the path users take when navigating from one page or Event to the next. This report can help you discover what content keeps users engaged with your site and can also help identify potential content issues. Navigate to Behaviour >> Behaviour Flow. Select the Content directory Content Grouping. Change the dimension to Default Channel Grouping. This report helps to analyse how people enter your site via organic search and then navigate from one section to the other and where they drop off. You can report this process per channel to see how visitors from each channel perform. Note! You will need to have event tracking set up prior to accessing this report. Navigate to Events >> Pages. By using secondary dimensions and table filters you can further drill down on your event data to make it more actionable. Now that you're ready to source the data for your site's Content Groupings I hope it awakens your creativity to work with Content Groupings in Google Analytics. If you have any creative applications for Content Groupings, let us know in the comments section below.